Late November and the lunchtime crowd at Casa do Lago is looking a little bit thin. Admittedly it is out of season, yet the unusually warm sunny weather has brought the few of us out onto the lakeside terrace to eat. 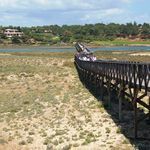 Casa do Lago has long been the headline restaurant here on the Quinta do Lago estate, a legendary resort surrounded by a 2,000-acre chunk of the Ria Formosa nature reserve. 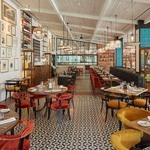 The restaurant is understatedly stylish and a regular haunt for well-heeled patrons drawn here for the outstanding fresh fish and seafood by chef John Nolan. I say understatedly stylish because, in reality, it is a simple rustic dwelling designed as a fisherman’s hut with nets hanging from the ceiling, wooden floors and furniture and simple white-washed walls. 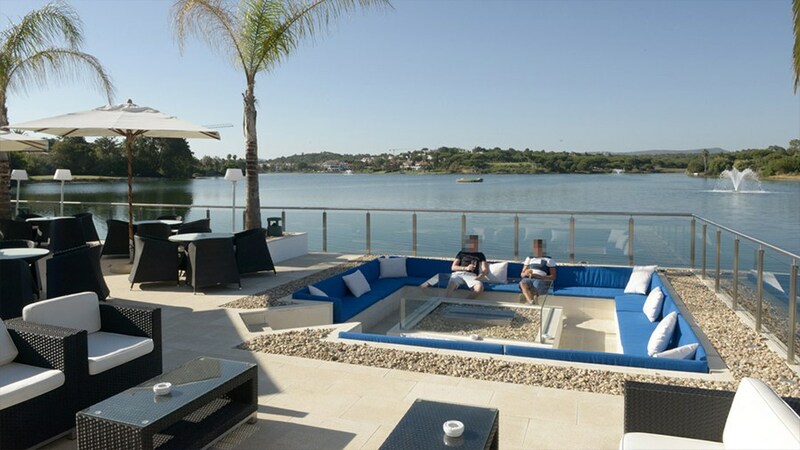 Of course, to keep the rustic dream alive it’s best to factor out the shimmering outdoor pool, the impressive fire pit and the spectacular lakeside terrace and bar. This time of the year though, it’s lunch-only. Bovino is the only evening restaurant open at Quinta do Lago, but during the season, a moonlight dinner here is a romantic necessity. Nevertheless, the warm weather is a bonus, so we sit on the terrace grasping a chilled glass of Vinho Verde and wait for the magic to happen. 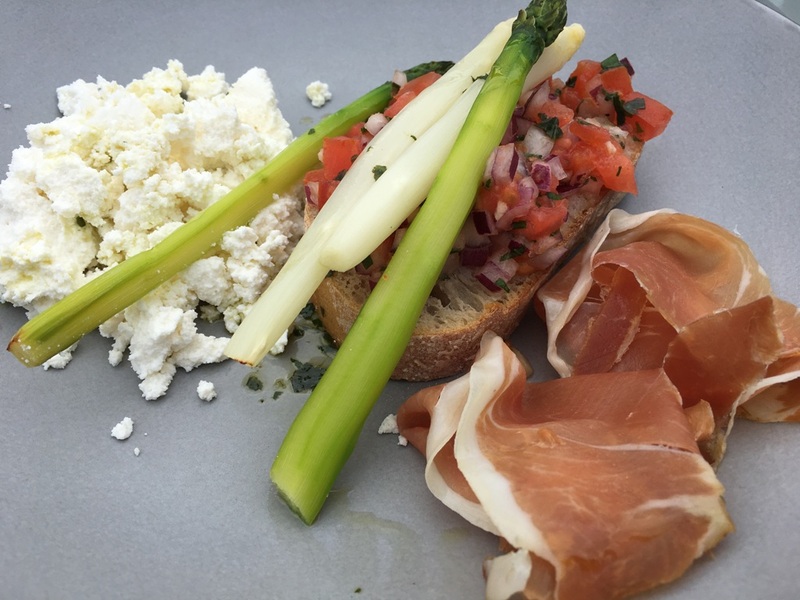 Pan Catalan with new season asparagus (white and green), toasted sourdough rubbed with garlic, tomato olive oil, Serrano ham, basil and fresh ricotta cheese (€17.50) is up first. The ricotta tastes dairy fresh, the ham delicious and the sourdough satisfyingly crunchy. Suddenly, I feel stares of longing from the lake as a group of ducks sense a feeding opportunity. A plate of fresh salt and pepper calamari with tempura batter, rocket, chilli and coriander mayonnaise (€17) materialises for my dining partner. Nobody speaks for some time. The ducks are looking very sad. We’re armed with fresh glasses of Vinho Verde as we await our main courses. 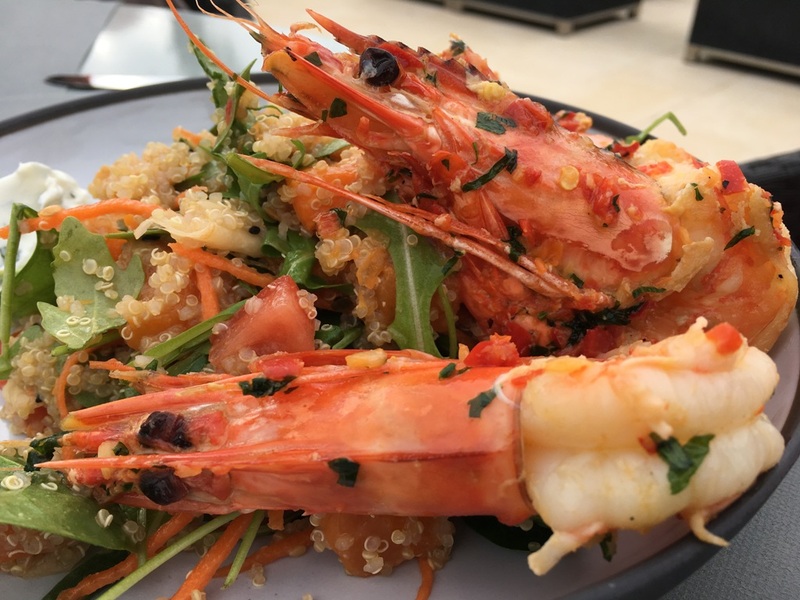 Grilled tiger prawn salad with roast pumpkin and quinoa, pickled ginger, mint, labneh, sesame seeds, chilli and lime (€24). 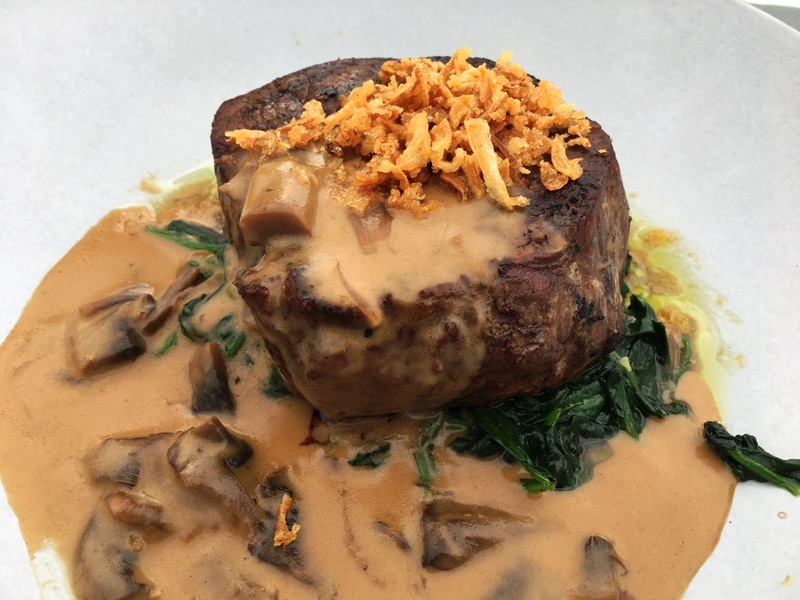 And for me, fillet of Black Angus beef sautéed spinach, sauce Diane and fries (€29.50). For good measure, we share a plate salt and pepper tofu tempura tofu, baby spinach, shredded carrot, kale, tomato, steamed rice, chickpeas, tahini dressing and sesame seeds (€22). Portugal’s Algarve coast is blessed with some of the best fresh seafood in the Iberian region and there is nothing quite like eating it fresh-from-the-market. The tiger prawns are epic. The steak is a triumph. The tofu, soft, creamy and delicious as a dip and nibble and didn’t need the rice in my opinion. Diners at a nearby table get up and throw a few morsels in the lake to what is now, quite an audience. It’s a futile gesture quite frankly and I sense serious envy. “Can we tempt you with a dessert?” we’re asked. I’m aware time is marching on and we might be outstaying our welcome. We’re the only ones left now and even the ducks have lost interest and given up. It really is an easy sell. The sun is just starting to dip and the lake view begins to transform as dusk approaches. 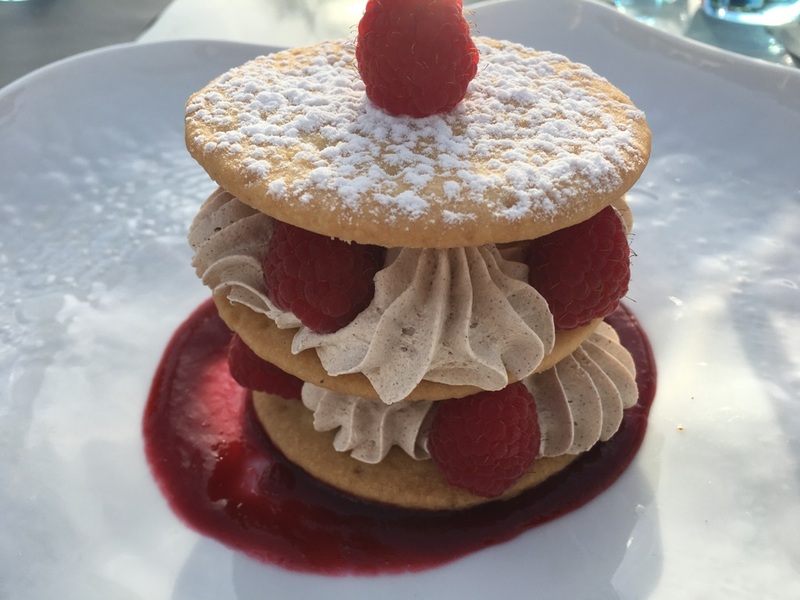 One final glass of Vinho Verde is quickly joined by a plate of fresh local raspberries layered with homemade shortbread, cinnamon cream and raspberry sorbet (€9.5). The cinnamon a perfect foil to the tart raspberries. 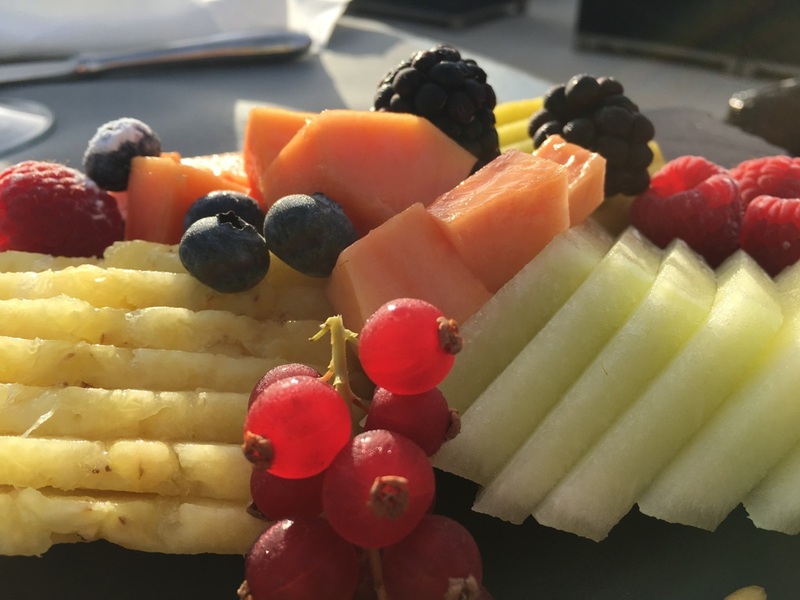 A palate-cleansing fresh fruit platter (€8.5) is the perfect finale to a truly memorable afternoon. 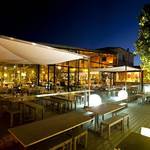 Casa do Lago rightfully takes pride of place in Quinta’s excellent crop of restaurants. 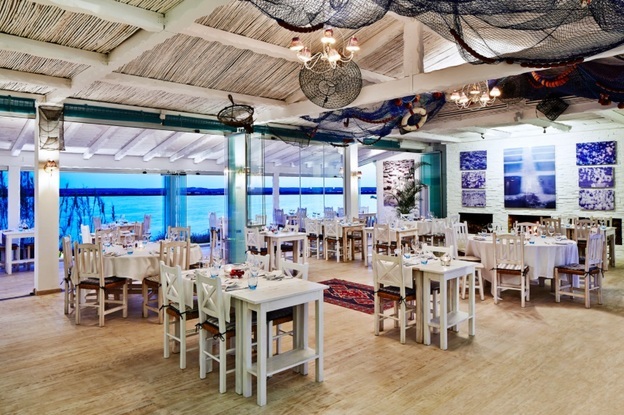 The food and service are consistently top drawer and the setting is spectacular. It’s a very special place to come whatever the time of year.